The oldest living graduate of the Centre for Christian Studies (United Church Training School at the time of her graduation) has died at the age of 103 years. 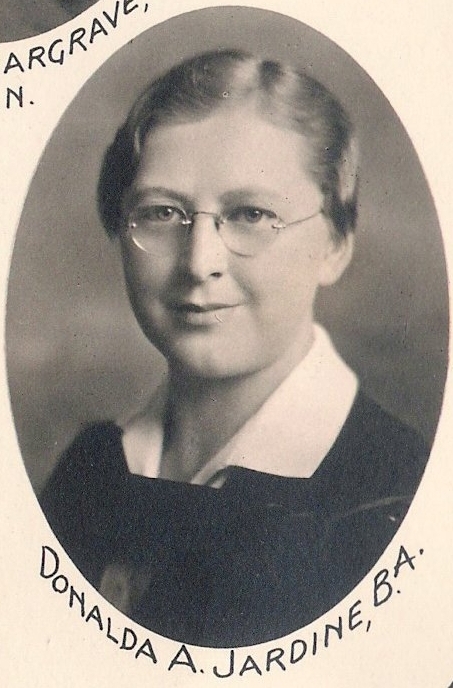 Born in Centre Napan, New Brunswick, Donalda Jardine became a teacher and principal of New Brunswick Schools until 1936 when she entered the United Church Training School with the hope (as per her application) of becoming “better fitted for the work winning the world for Christ.” Donalda graduated in 1937 and worked as a Women’s Missionary Society Worker and Deaconess in the United Church of Canada. She especially enjoyed her work with youth and at summer camps. Donalda remained a friend of CCS. In her file, we have a lovely letter acknowledging her delight in receiving a scroll of messages prepared by folks celebrating the 2007 graduation ceremonies of CCS that wished her well on the 70th anniversary of her graduation. It was a very moving experience for all of us who signed the scroll and felt connected to her through UCTS/CCS. A photo of Donalda with Charlotte Caron taken in November 2010 appeared in an earlier email update. We give thanks for Donalda’s life and for the Christian witness she offered in it.